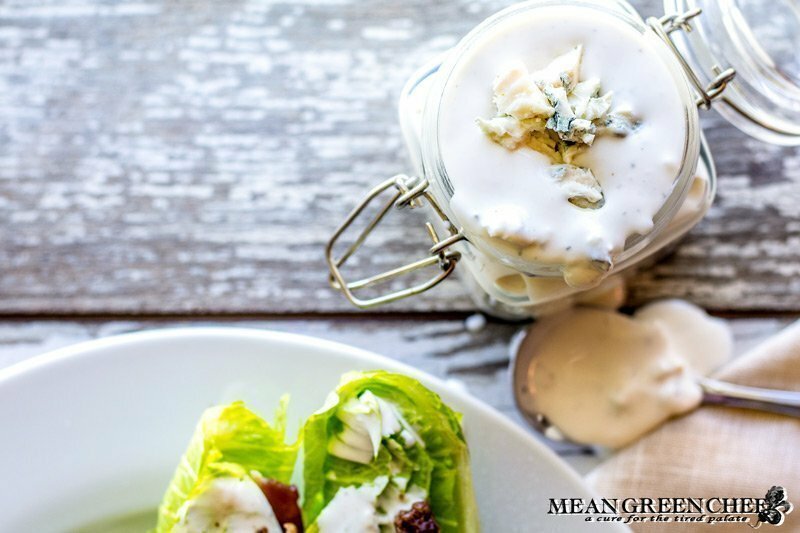 Buttermilk Blue Cheese Dressing cool, creamy, tangy and full of fresh blue cheese chunks! Perfect for topping a pile of fresh greens, dipping hot wings or slathering on a juicy grilled burger. It’s incredibly easy to make and totally delicious! Plus, when you make your own it’s cheaper and you know exactly what’s in it, so no preservative surprises. The buttermilk is the key to creating the magical taste that mingles so well with blue cheese. If you don’t have buttermilk on hand, it’s ultra easy to make! Pour the lemon juice or vinegar into a measuring cup. Then, pour in the milk until it reaches the 1 cup (255ml) line. Stir the mixture well, then set aside for 10 minutes before using in your recipe. TIP: Not all blue cheese is created equally, steer clear of those pre-crumbled tubs, while they seem convenient and cost-effective they lack balance and flavor leaving your dressing lackluster and possibly flat and flavorless. Crumble a chunk of the best blue cheese you can afford! I’m not saying break the bank, this lovely wedge of Imported Gorgonzola was $8 with plenty left over for snacking or topping. What are some common types of Blue Cheese? Gorgonzola: Which is what we utilize for this dressing and our Alfredo, you’ll find it in the cheese section sitting next to straight up blue cheese. Gorgonzola is milder in flavor, crumbly and salty. Typically made from unskimmed cow or goat’s milk, first created in Gorgonzola Italy in 879 AD, making it one of the oldest marbled cheeses. You’ll find it melted into risotto, and topping pasta, salads, and pizzas. Bleu Cheese: Sharp, and salty with a pungent aroma. Crafted from cow, sheep, or goat’s milk, discovered by accident in the early middle ages. It’s sharper bite is perfect for figs, pear and apple slices drizzled with honey and smashed walnuts. Of course, it’s also wonderful in soups, salads and just about anything else. Danish Blue Cheese: Also known as Danablu, it’s mild and made from full fat cow’s milk and homogenized cream. Also like other blue cheese varieties, it’s great served on salads, with fresh fruit and as a garnish for broccoli and potato soup. Bleu d’ Auvergne: Hailing from the major town in the Massif Central in southern France, it’s one of the world’s best known marbled cheeses. Less sharp than most of the others, with mold that ranges from blue-green to blue-black. Queso de Cabrales: A blue cheese characteristic of the Asturias, in Spain. Protected since 1981 and made only in rural settings, it has almost no rind and is amazingly creamy. A sharp flavor and strong odor are the results of adding sheep’s and goat’s milk to the cow’s milk. Buttermilk Blue Cheese Dressing cool, creamy, tangy and full of fresh blue cheese chunks. Perfect for topping a pile of fresh greens, dipping hot wings or slathering on a juicy grilled burger. It's incredibly easy to make and totally delicious! Add sour cream, mayonnaise, buttermilk, white wine vinegar, sugar, garlic paste, and blue cheese to a glass mixing bowl. Mix until thoroughly combined, cover and chill 4 hours or overnight for better flavor. Store in an airtight container up to 3 days in the refrigerator. All your recipes look so amazing, Angela! I haven’t encountered a dairy-free salad dressing that looks as good as this, although there is a Daiya blue cheese dressing in the health food store that works pretty well as a substitute. Oh, I just made my first dairy-free yogurt with cashews earlier this week, and it’s really good! So excited..I am making this over the weekend! I love blue cheese and this seems so easy! Thank you! Ooo this looks amazing, and I’m not even a big fan of blue cheese! Oh I think I’m going to have to make this for Easter. I love love love blue cheese dressing. The type a cheese really does matter. This looks delicious! I love blue cheese dressing so will need to make this! Thanks for sharing. Great, thanks so much for stopping by to check it out, Lina! 🙂 Make sure to post a pic on our Facebook Page too @meangreenchef! I never knew there were so many different types of blue cheese. I can’t wait to make this. Couldn’t pin this one fast enough! It looks so good. I love that there’s virtually no sugar and so much cheese. Yum! Hi Angela I am so excited to try this recipe thank you for sharing! I love your pics by the way. Blue Cheese Dressing is my husband’s absolute favorite…I had no idea it was this easy to make! Definitely going to have to try this one! And like everyone else has said, your pictures are always lovely! This looks great! You always have great pictures too! I love homemade dressing. In fact that is all that we have at our home. Thanks for this recipes. As I get older, my appreciation for blue cheese is increasing! Right now I can eat Gorgonzola but I am venturing out and trying new types! I will have to keep this recipe in mind! This sounds delicious and surprisingly easy! Thank you for sharing. 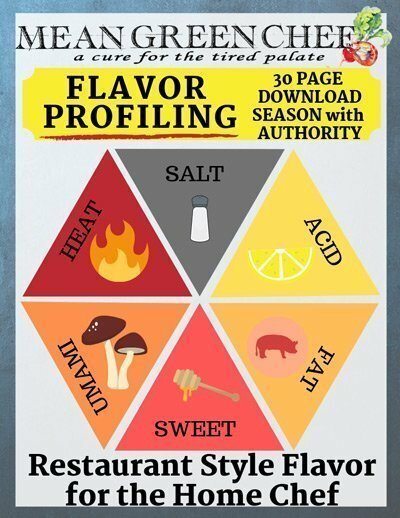 I’m going to try it the next time we make wings! The dressing can make or break a salad – and I love ones that are homemade! I agree, Janine, homemade dressings taste so much better than the shelf varieties!